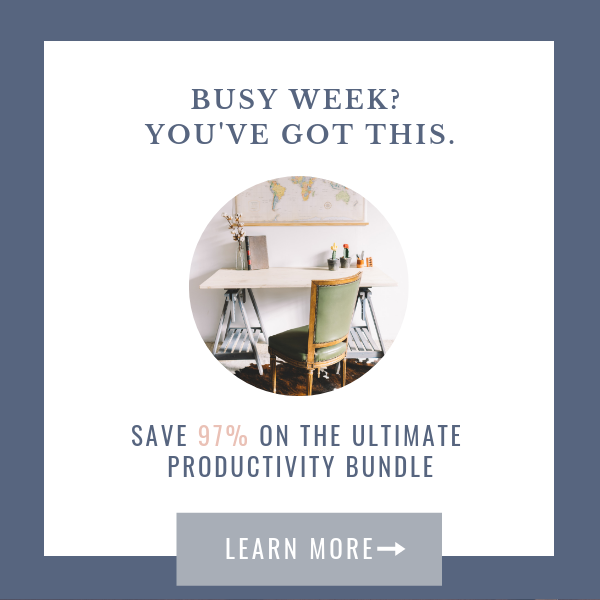 This blog post contains affiliate links which will reward me with money at no extra cost to you if you use them to make a purchase. One bride to another... it helps me pay for what I spent on my wedding! 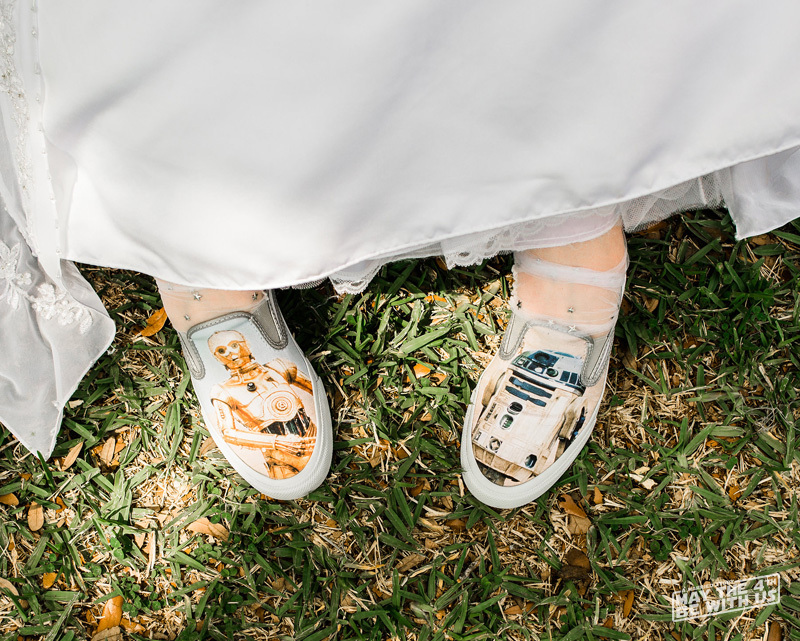 If you’re looking to incorporate Star Wars into your wedding, there’s certainly plenty of ways to do it, including your wedding attire. 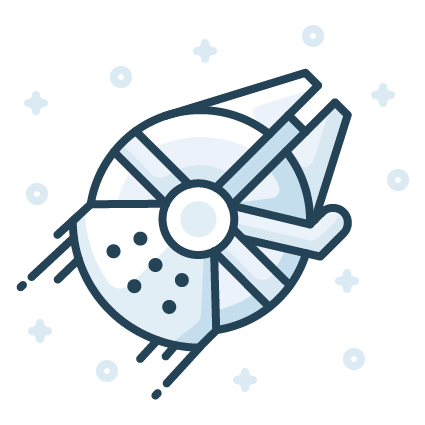 Keep in mind… we found a lot of great ideas for Star Wars wedding attire on Pinterest, but we were also trying to be cost efficient and make reasonable choices that best reflected our tastes and budget. 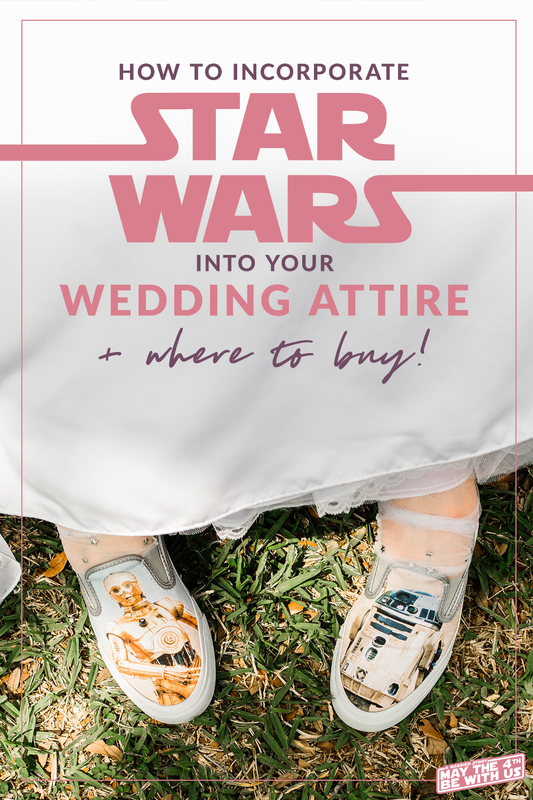 Here’s our story and how we put together Star Wars wedding attire that was affordable, functional, and subtle. Keeping in mind that we were trying desperately to stick within a $5,000 wedding budget (yes, including our venues… because we’re just two crazy kids), we had what we thought was a grand, money-saving idea… Custom-made Robes! 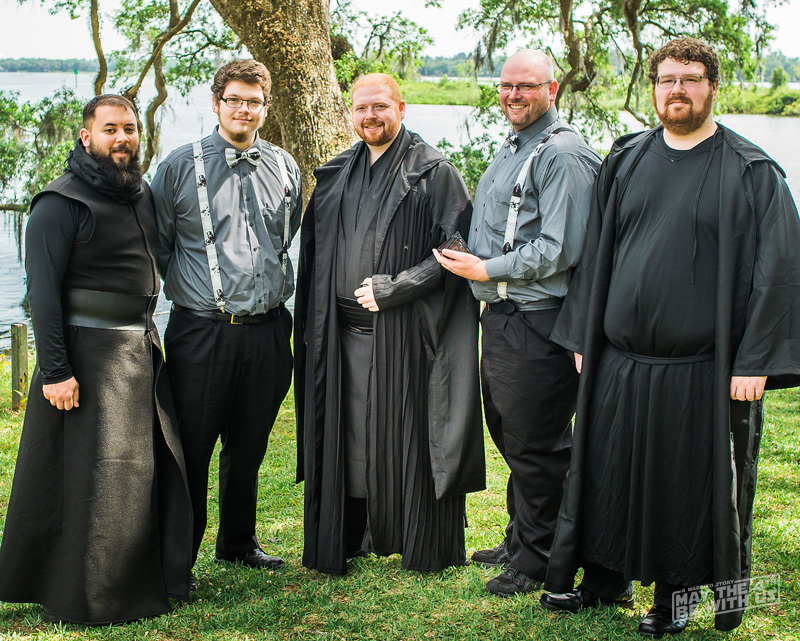 Our thought process here was that it would be a lot less stressful for everyone involved if we just had robes made for everyone in our wedding party. No one would have to buy a dress or rent a tux. I didn’t really need to do much organizing. I just needed some fabric, and someone to make these robes. Kimi, why didn’t you just order some online from a costume shop? If you think that sounds like a smart and totally reasonable idea, you’d be right! 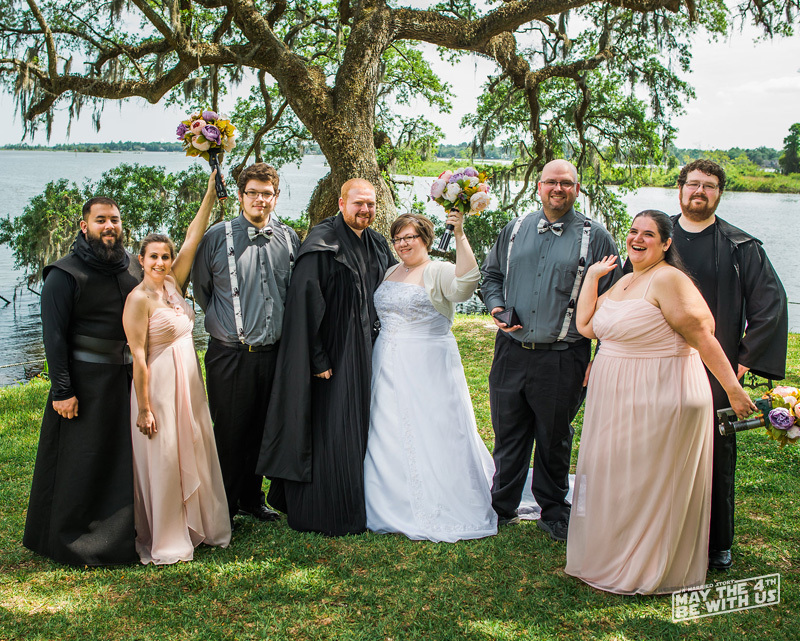 The issue is that I saw some pictures on Pinterest where someone had incorporated Jedi robes into their wedding attire and the robes clearly weren’t long enough – like, barely calf-length. 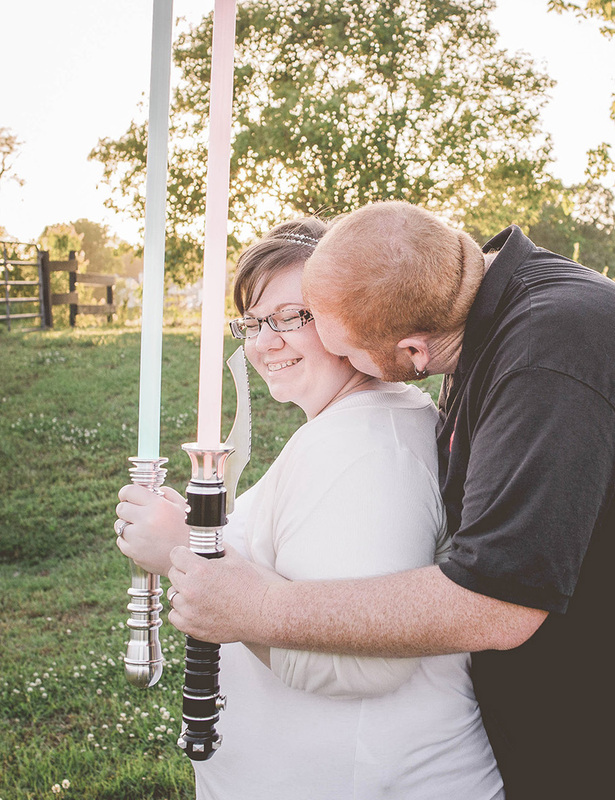 It was such a cool idea, but poorly executed and I didn’t want to look back at our wedding pictures and hate it. I figured everyone could just comfortably wear whatever they wanted under their robes, so no one would have to spend money just to stand in our wedding. As luck would have it, my best friend’s Mom does a lot of sewing and she agreed to make the robes for us at a reasonable, hourly rate. I took Jeremy’s measurements for his height and general girth knowing that whatever robe fit him, was likely to fit any of his 3 brothers. My bridesmaids and I each had our measurements taken as well. Did you know that fabric is expensive? There’s not enough Joann’s coupons in the world that could have saved me from myself. Thanks to the suggestion of our seamstress, we bought king-sized sheets on clearance with the idea in mind that there would be enough fabric for 2 robes. A couple of weeks went by and I got a Facebook message from her, alerting me to the fact that sewing these robes was proving to be much more difficult that anyone could have guessed – largely because of the cheap, polyester fabric not cooperating. It took over 10 hours to cut out the pieces, begin assembling them, and sewing them together. Granted, she’s not a professional seamstress… but she’s definitely experienced enough that the problem wasn’t her – it was the terrible fabric she’d been supplied with. I felt so rotten about it, and although she only charged us $50 for the one robe (way less than she should have based on the hourly rate we agreed to), I just couldn’t in good conscience put someone through the work of making the robes if it was really that hard to do. My bridesmaids were truly amazing. I couldn’t have chosen two better people to have by my side. I was feeling really stressed out about the attire. I hated the tradition of asking someone to be a bridesmaid and then asking them to buy their own dress – especially since it was unlikely they’d ever wear the dress again. But my girls rallied together and took charge. They had both planned to buy something to wear under their robes anyways, so they insisted on buying dresses in order to relieve some of my stress. 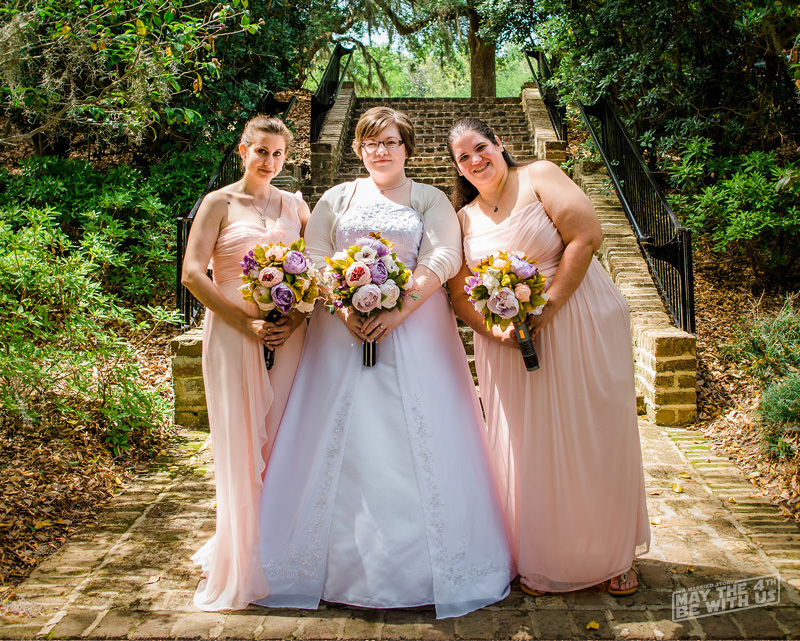 They shopped around online at David’s Bridal and selected matching dresses in different styles. I love that they each got to choose a dress that they felt comfortable in. The dresses were surprisingly not very expensive – they each paid well under $100. They were pretty true to size as well. They really only needed length alterations. I was really impressed at how well the dresses fit considering they were purchased online. 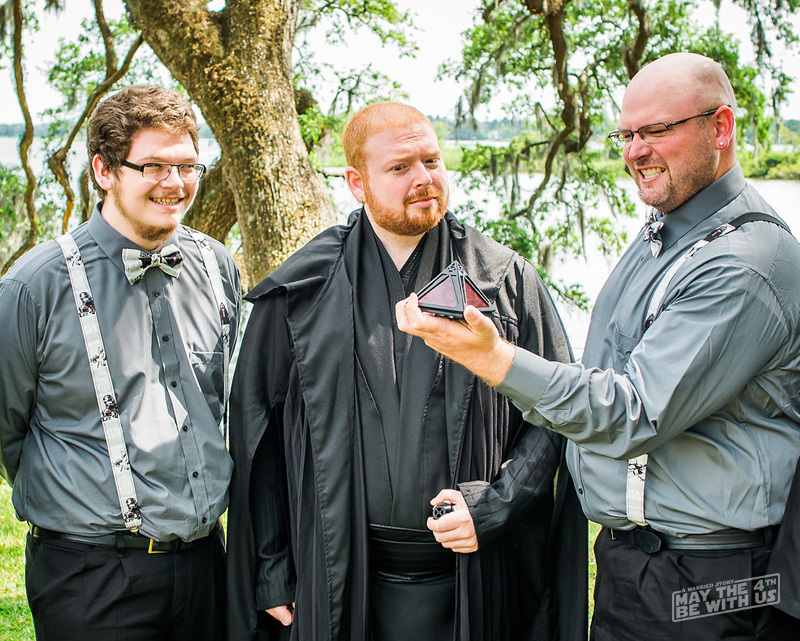 A nice touch was that both bridesmaids wore a Stainless Steel Star Wars Jedi/Sith split pendant necklace I’d given to them as gifts when I asked them to be my bridesmaids. It was a personal, subtle touch. 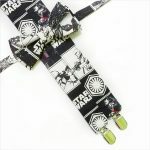 Like the lightsaber bouquets? 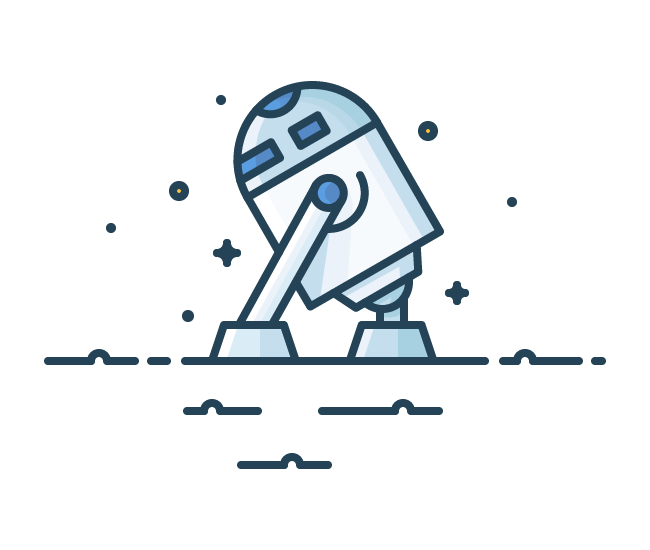 Read about how we made them + what you’ll need! 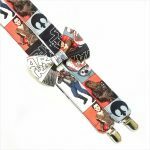 But where their attire really shines is the matching Star Wars Suspenders and Bow Tie sets they wore. I loved these so much. 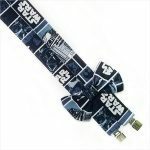 The quality was impressive – way better than I expected. They were a fun and subtle addition. 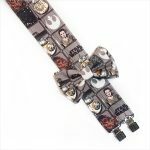 Check out all of the patterns available and find a set of Star Wars suspenders and bow tie that matches your wedding colors! One of the first things out of Jeremy’s mouth were about him dressing up in full Sith attire. Our concern is that we already knew how difficult it was to have a robe made, much less all of the parts he’d need if he really wanted a full costume. And let’s get real… Jeremy’s a larger, barrel-chested man. We weren’t going to find a costume that fit him properly at a regular store. I started doing research and found a few places that admittedly made me kind of nervous. 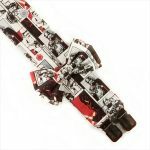 It’s just… the prices seemed pretty reasonable considering all the pieces that we involved and the detail of the images. One of those places was called Ezcosplay, and they sell a wide selection of custom-tailored cosplays at an affordable price. 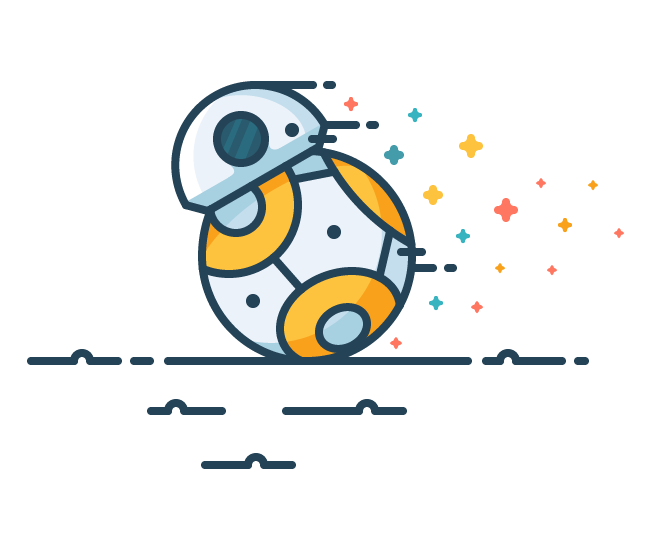 We wanted something that was obviously Star Wars inspired, but didn’t seem as character specific. That’s why we chose this Darth Maul Suit with Cloak. Without the iconic Darth Maul face paint, it really just looked like Jeremy was wearing every day Sith attire. You’ll maybe notice that Jeremy isn’t wearing all of the pieces. It came with some otherwise oddly made gloves and some faux boots meant to cover your shoes. But even with the measurements I gave, neither of those things were ever destined to fit correctly. Jeremy just wore black shoes and we called it good. Are you eyeing that ring box? Read about how we made it + where to get your own. I admittedly spent a lot of time unsure of what I wanted for my wedding dress. Would I hate myself for it later if I didn’t get the traditional, white wedding dress? Was it weird if I just added some Star Wars elements to my attire to bring it all together? I purchased a gorgeous, white blouse from Amazon because at one point, I was considering a bridal top and very poofy tulle skirt. Once I saw the blouse on me, I was 100% sure I needed the traditional, white wedding gown. I was so taken aback by how excited it made me… how beautiful I felt when I looked at myself in the mirror, even if it was only from the waist up. Allow me to have my Father of the Bride moment here… I have always wanted special tennis shoes for my wedding. When it came time to find some shoes to wear, I already knew that they had to be: Flats, Comfortable, and Reasonably not bulky. 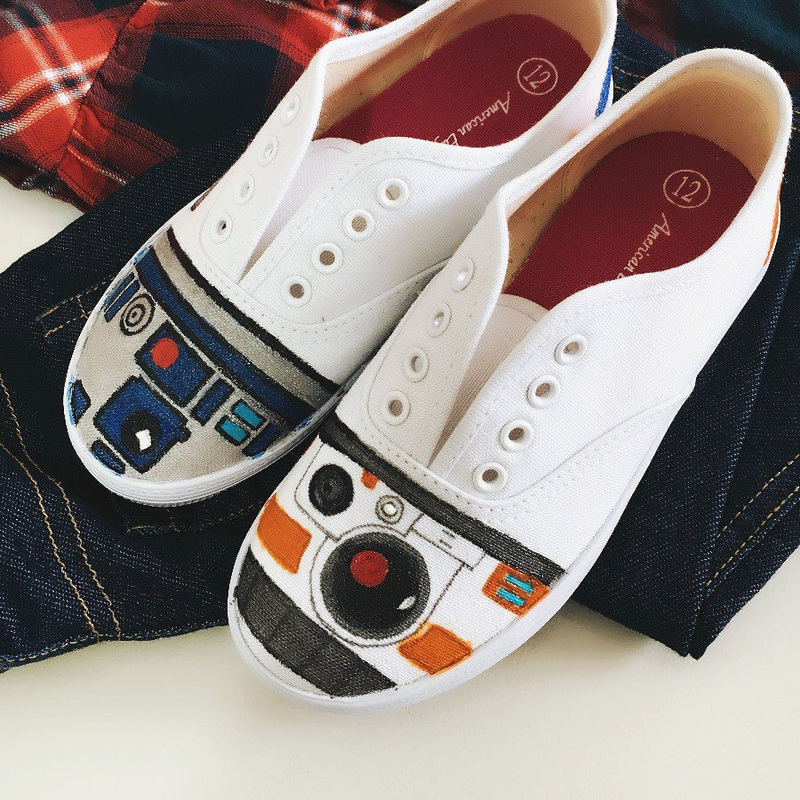 I kept finding cute Star Wars inspired shoes on Pinterest – mostly custom made Star Wars shoes on Etsy, and some from Think Geek. 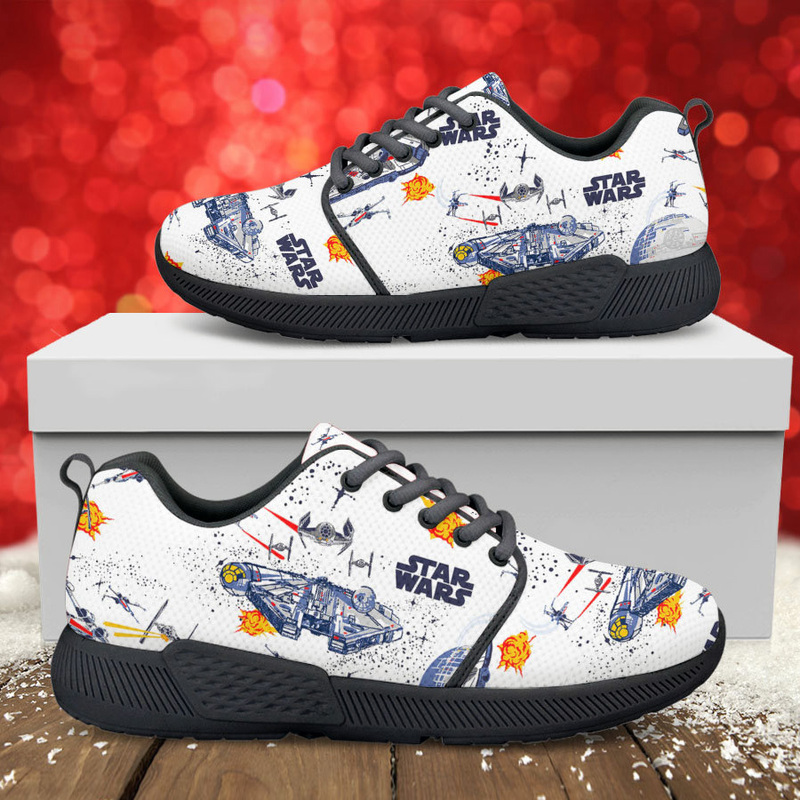 But I fell in love with and chose these Star Wars boat shoes from Sperry (sorry, this specific style is no longer available). 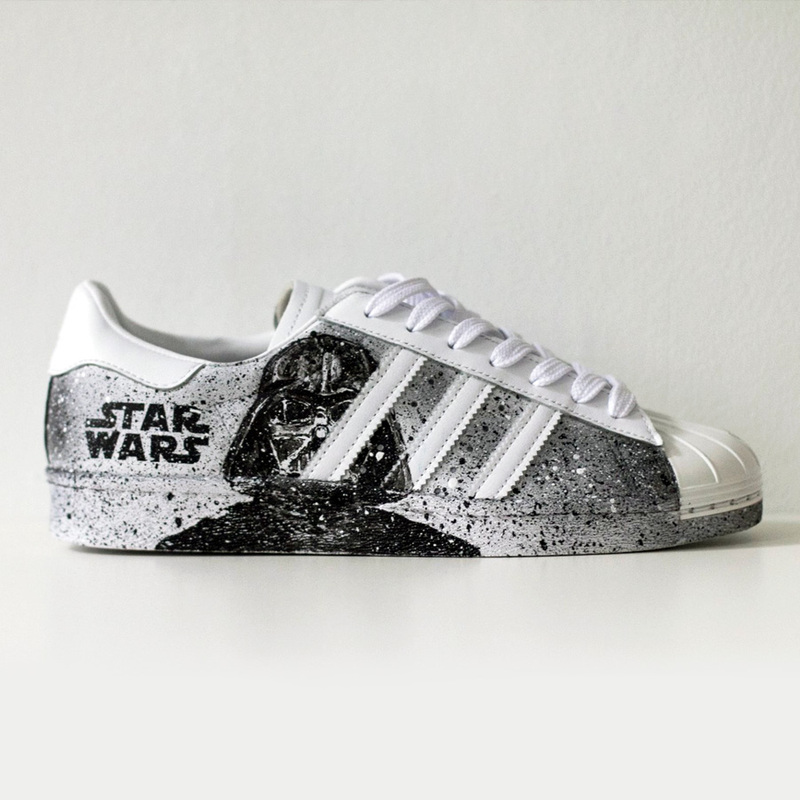 I liked that they were primarily white, since most Star Wars shoes tend to be black, gray, or red it seems. They became my “something new” and my “something blue”. I hated the idea of wearing socks, but also didn’t like the thought of not having some sort of protection between my feet and the shoes. I’d worn them before the wedding in attempts to break them in, and found that they rubbed the back of my ankles pretty badly the first few times. I bought the cutest sheer “socks” with little metal stars on them to put a little space between my feet and the shoes. 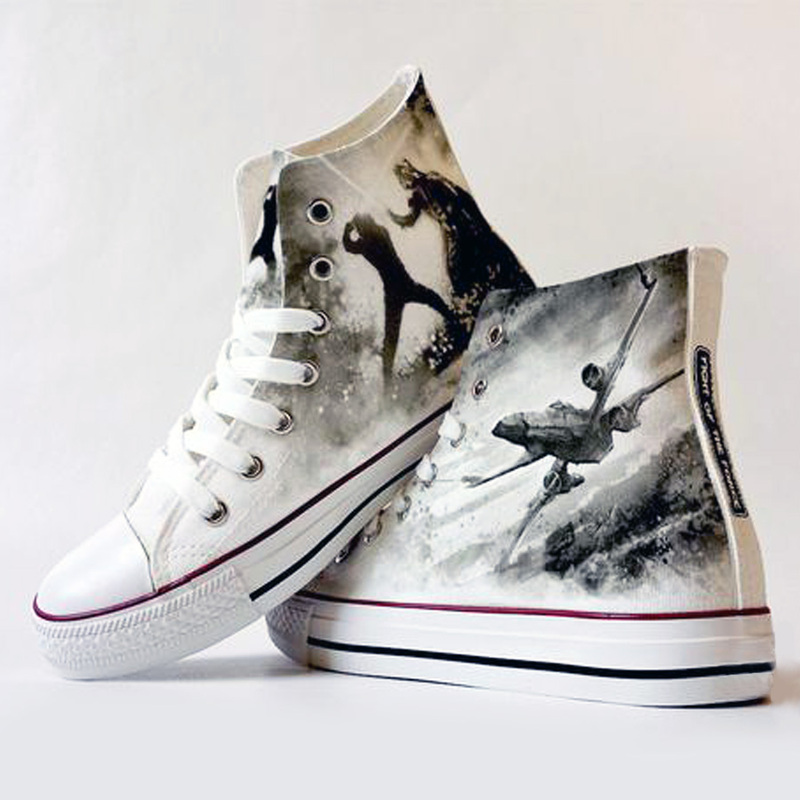 They were incredibly affordable – much less expensive than others I have seen on Etsy for literally over 20x the cost. 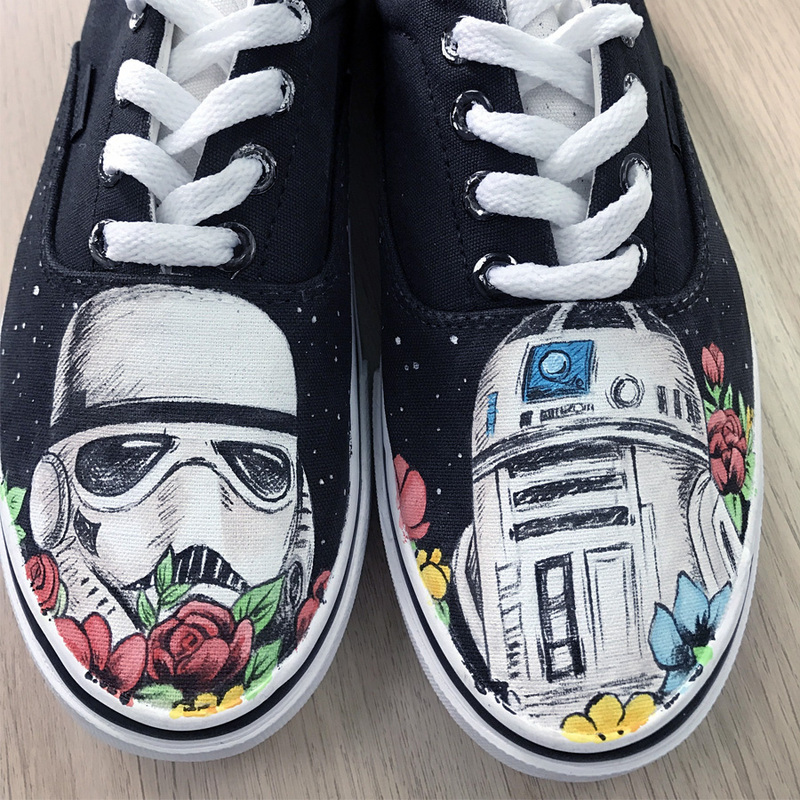 Since the ones I bought are no longer available, I thought I’d search around for other Star Wars inspired shoes you could wear at your wedding instead! 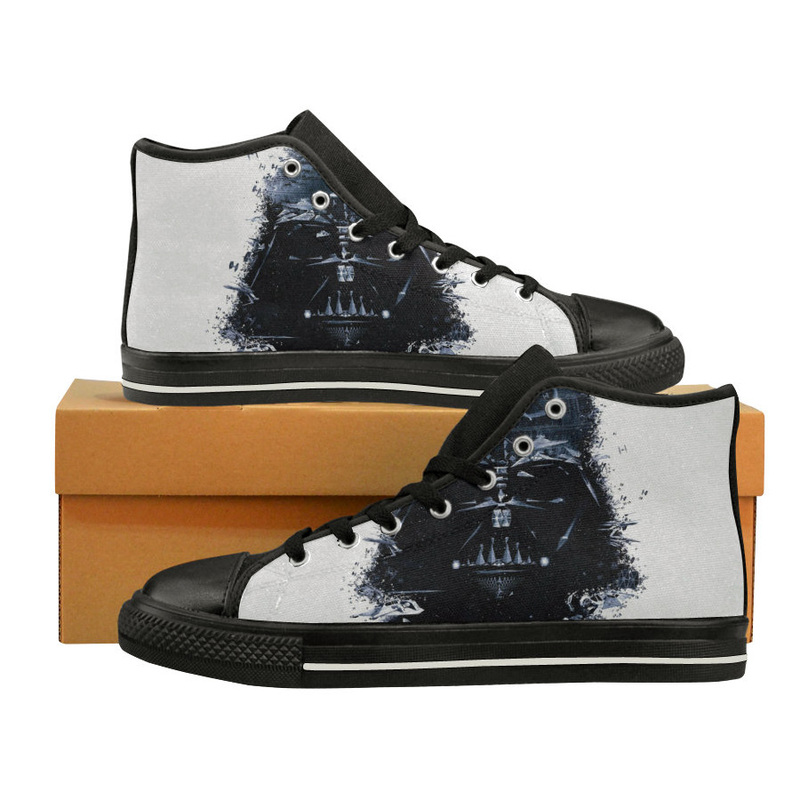 In addition to my Star Wars shoes and my lightsaber bouquet, I had a couple of other little details you might like, including wearing a matching Stainless Steel Star Wars Jedi/Sith split pendant necklace with my bridesmaids, and these Sterling Silver Tiny Star Stud Earrings. 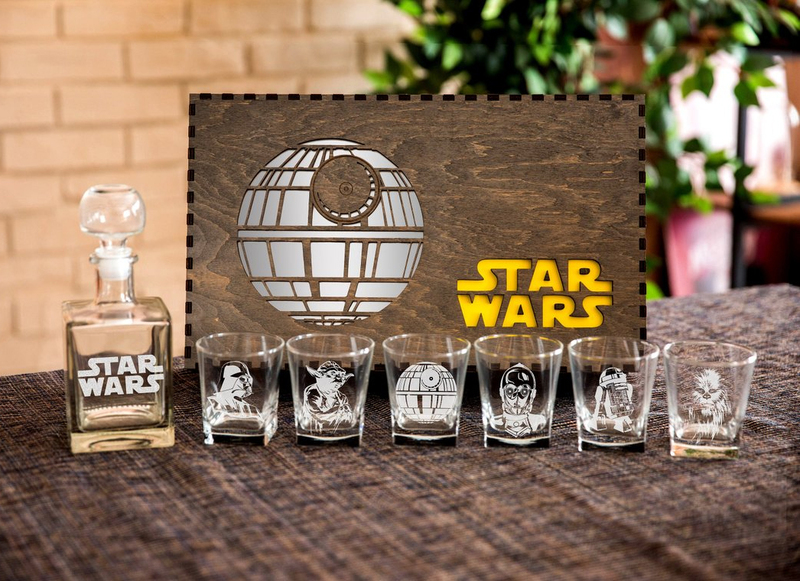 How will you incorporate Star Wars into your wedding? I’d love to hear which details are your favorite from my wedding party’s attire, or ideas you’ve discovered for your own! Let me know in the comments.